A renovation can be stressful enough without encountering unexpected problems like asbestos, rising damp or dodgy plumbing and to a failing roof or wiring that’s not up to code. Our best piece of advice to you is always be ready for unexpected adjustments – ESPECIALLY when it’s an older home. Thankfully these issues can all be worked out during the planning stages of your renovation. 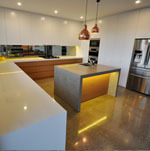 Having been experienced in many kitchen renos, we have seen a lot of mistakes made. Some are big, some are small, but they all have one thing in common: They don’t all need to happen. Here we list 5 things to avoid in your next renovation to avoid mistakes. A proper renovation takes preparation – lots of it. A detailed plan will help keep you on budget and on time. We’ve heard so many people say that their home renovation is a month overdue and over budget and I find that to be a tough pill to swallow but it’s just one of those things you have to be prepared for. Set out a very specific agreement with your contractor before the work begins and get everything in writing. You should be able to see on paper how your renovation is going to play out before it even begins. I can’t stress this enough: Don’t buy materials or appliances until your renovation is planned out and all measurements have been taken. Online sales can be tempting, but that great deal on a 20-inch dishwasher isn’t going to save you any money if you only have room for an 18-inch model. When you tear down walls or rip up floors, there’s a good chance you’re going to find something you weren’t expecting, especially in an older home. Electrical and plumbing issues need to be dealt with before you close the walls back up. It might be an unexpected renovation cost up front, but it will save you tons of money in the long run. For electrical issues, my advice is to have a licensed electrician inspect the wiring in your home. If it needs rewiring, expect to pay more. Don’t do it. Much like ignoring issues, cutting corners on materials or finishes is only going to cause you problems in the future. It’s always better to go the extra mile and do it right the first time than have to go back and redo everything. Hire competent people to do the job, buy quality materials and take the time to complete all the necessary steps. I love ambitious homeowners who want to take part in their home renovations, but there comes a time when it’s best to hand the reins over to the professionals. Projects like cabinetry installation, complicated tile work and carpentry are beyond the scope of most homeowners and can reduce the value of your home if done incorrectly. My advice? Involve yourself in the demo – it’s the most fun part, anyway!